Successfully Added Solar Home Lighting System - 5W Solar Panel with 5 Meter Cable, 2x1W Bulbs, 4400mAh Power Bank, Eco-friendly, Noiseless to your Shopping Cart. This solar home lighting system will collect the sun’s energy to power up your home and small electronics. 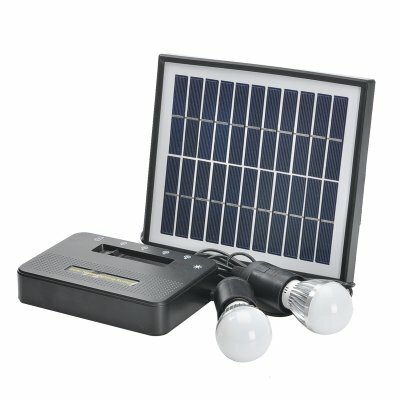 The solar lighting system comes with a 5W solar panel, a 5-meter cable, 2 light bulbs and great savings for your household. The solar lighting system will provide your home with a renewable energy source and a 4400mAh power bank to keep your lights bright and charge up small appliances. In the box, you will find everything you need to get the system set up. You will have a 5W solar panel, a 4400mAh power bank, 2 LED Bulbs and all the necessary fixings and cables. The solar home lighting system comes with a simple set of controls and is easy to operate. You will have 2 outputs for connecting your LED bulbs and one USB port. Simply put the 5W LED panel in the sun and collect the free clean energy to power your home. You can use the USB port for charging your mobile phone, tablet or other small gadgetry. What are the main benefits of the solar home lighting system? First, you will be saving a whole lot on electricity bills as the whole system will be running at zero cost. Second, the system comes with few moveable parts and will be easy to maintain. Last, but not least, the solar home lighting system is environmentally-friendly and does not result in any pollution – making it a really clean and energy-saving way to power up your home. The Solar Home Lighting System comes with a 12 months warranty, brought to you by the leader in electronic devices as well as wholesale solar home lighting systems..